This mega freezer meal yields seven 9×13 baking pans full. I hope it’s a favorite for your family! Combined all of the shredded chicken, frozen broccoli, sour cream, cream of mushroom soup, 5 cups of cheese, and 64 cups of cooked noodles into large mixing container (this is where I use my 22 qt stock pot) and gently mix together. Fill each of the seven 9×13 pans with the Chicken Broccoli Alfredo mixture. Sprinkle each pan lightly with parmesan cheese sprinkles and salt/pepper per family preference. 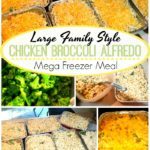 Set the desired pans of Chicken Broccoli Alfredo Bake out in the refrigerator the evening before you’d like to serve them. Preheat your oven to 400 (oven times and temperatures may vary). Place Casserole in preheated oven for 1 hour or until heated through and hot and bubbly.